Its biggest flaw is that every manager has the right, and happily uses it, to choose the index that pleases him. So they usually pick the one that has the greatest chance to make them look better and not especially the one that will allow us to compare them correctly with their peers. 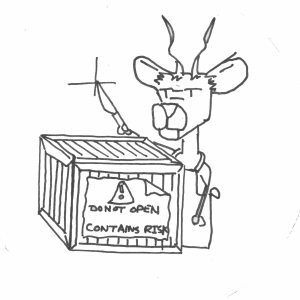 And they often choose benchmarks that do not disclose their own composition… which means they are not very usefull. How are we supposed to understand what is really inside ? How can a normal, not so passionate about it, normal investor assess the risk it bears holding this fund ? And even if we master the separate components, how could we be sure of those components weights being representative ? Therefore when analyzing/comparing funds we always end up with a load of custom and mixed benchmarks, which are often unknown and opaques, never easily comparable, that might not be representative of the assets really owned, and that cannot give us any information about the dynamic strategy of the fund management. Seems like we need a better strategy to analyze and compare active funds don’t you think ? Here is what I propose : first get a set of good benchmarks. Then use them to open up those funds black boxes in a rigorous and standardized way. Let’s do that. So first what is a good benchmark ? Specified in advance, 2. Appropriate, 3. Measurable, 4. Unambiguous, 5. Reflective of current investment opinions, 6. Accountable and 7. Investable. I will not detail them as this will get off-topic but I do invite everyone to familiarize with this great framework for analyzing benchmarks. This CFA Institute method is specific to financial benchmarks of course but I am pretty sure that the underlying concepts could be generalized to other fields of application for my non financial readers. Anyway, I will focus on 2 of the 7 listed criterion as they appear to me as the least respected ones in usual fund benchmarks. Appropriate “The benchmark is consistent with the manager’s investment style or area of expertise”. In statistical terms this means that whatever the benchmark is, it should have a very strong correlation with the fund’s evolution. Investable: “It is possible to simply hold the benchmark”. This is very important. Who really cares about a benchmark that no one can actually invest in anyway ? A financial comparison will only make sense if it allows you to make a practical choice of investment : “this fund has been lagging its benchmark by 2% a year for the last 10 years, maybe I should invest in the benchmark instead…”. To those two important principles I will add a third one that is especially needed when trying to compare funds on a larger scale. The benchmarks must be standardized. This means that there should be a unique set of fund benchmarks that respect all 7 “SAMURAI” conditions but that can also be used to compare all funds whatever the manager, style or asset class. The benchmarks must be homogeneous : funds invested in the same asset class must be very strongly correlated with the corresponding class benchmark. They must be mutually exclusive : benchmarks from different asset classes must be sufficiently uncorrelated. They must all together cover the entire universe of investable securities. Oh, so maybe could ETFs be good benchmarks ? Indeed ! They are potentially amazing benchmarks. And this why I did chose them as the base construction blocks for my personal set of standardized benchmarks. They individually respect the 7 SAMURAI conditions. And especially the 7th, as they are very investable. It is possible to find a set of trackers that covers the great majority of all available asset classes. Condition 3 is met. They can be selected to be sufficiently mutually exclusive in order to make them representative of a specific market segment. Condition 2. Finally it is possible to regroup them according to their asset class as they are, by design, very close of each other inside each asset class thus making them very homogeneous. Condition 1. Ok so that is the theory. Let’s get to practice. Let’s create the set of benchmarks. First we have to divide the investable securities universe into asset classes that are sufficiently mutually exclusives. This, as it is not easy, is a trial and error process. But one can easily construct a sound enough structure from scratch. 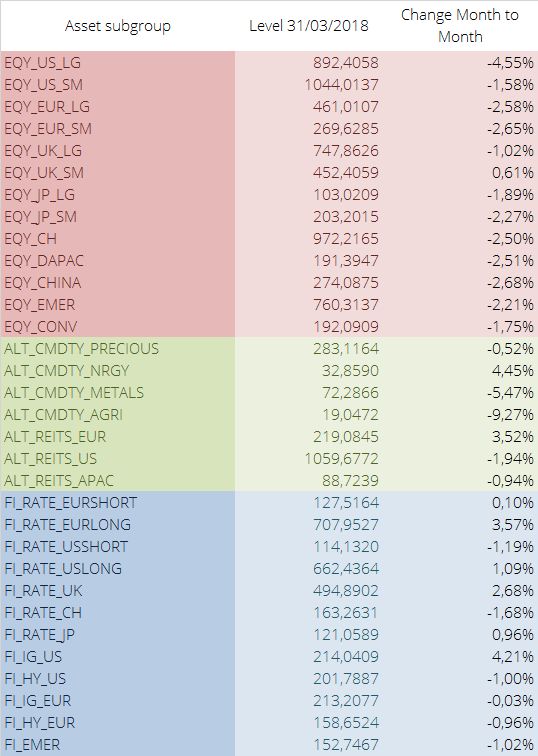 Second we have to select for each of those asset classes between 2 and 3 ETFs that are strongly correlated and representative of the asset class underlying assets. We then combine them along a standardized, simple and “Specified in advance” method to create an investable basket of ETFs for each asset class. Third we need to correct for various standardizations problems like distributing/non distributing ETFs, missing histories, closed funds, differing currencies… this is not fun but doable. And can we analyze and compare funds with this ? Now that we have a good set of passive ETF benchmarks, well let’s try to dissect active funds with them. 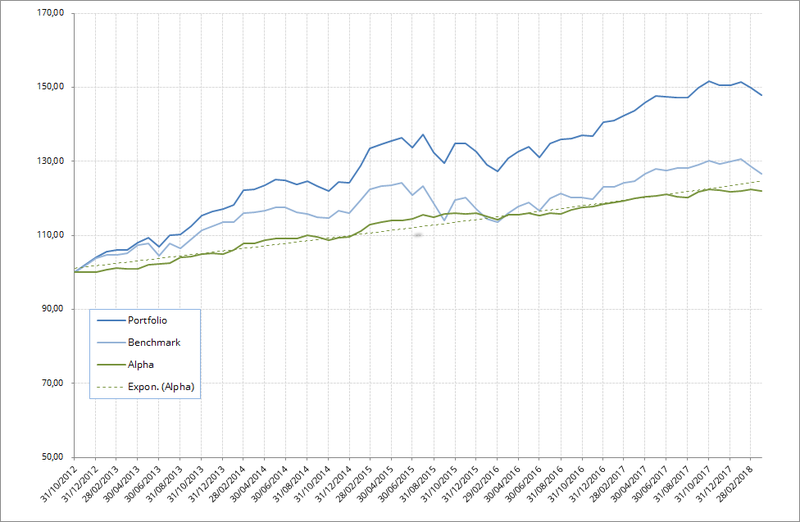 In fact this is quite straightforward now : we can “just very simply compute” the linear combination of 3 of those ETF benchmarks that is the more “appropriate” to describe the fund’s evolution. Other methods are of course possible, this is just one possibility. By “appropriate” I of course mean closely correlated, or any similar measure of strong correspondence in risks and exposition between the fund’s and its specific custom benchmark. By “just very simply compute” I of course mean a standard regression of the fund’s history against the benchmark’s to determine the weights of the various asset classes. This should gives us the mix that is the most representative of the fund’s allocation. This does sound quite simple. Maybe a bit too simple ? Good news : it works quite well ! Looks good. But most importantly : looks very similar. As you can see the regression is not perfect. The “Swiss” allocation result does seems a bit weird. But the correlation is indeed very high and this gives us a clear view of the fund general allocation, and a comparable investable ETFs mix we could use to reproduce its evolution. It also give us a very good benchmark to analyze its performance, and more importantly, its performance’s regularity. The *mix* is not properly “Specified in advance”. Indeed, as it computes for each fund a unique custom benchmark made of various ETFs baskets, which is okay, it does compute the *weights* of the various baskets with past information (regression on the history of fund and benchmarks), creating therefore a clear hindsight bias. This is true and implies that the dissection could have a mix that is not representative of the current allocation of the fund, which might have changed. However let’s be honest: funds strategy and allocations are rarely changed. When a fund is over performing, its strategy is confirmed. When a fund is under performing, it is closed. In the meantime this still constitutes a good framework for a standardized analysis of funds, be it for simple allocation analysis (“What do I really own in this fund?”) or performance analysis (“Is this manager delivering stable alpha or should I invest in those ETFs instead ?”). Maybe you could use it, or at least it most fundamental idea : ETFs are good benchmarks for active funds. I sure hope I helped anyway. Previous Previous post: Artificial intelligence, what can a video game tell us ? Next Next post: How can they possibly still like Trump ?